The April 23 TIME cover, depicting the growing chaos within the Trump White House, may look familiar to some readers: We asked longtime TIME collaborator Tim O’Brien to reimagine a cover he did for us just over a year ago. With his inventive style and fine hairline brush, Tim’s updated piece shows the rising water from the storms swirling inside the Oval Office. “When I painted the ‘Nothing to See Here’ cover art, like many, I assumed the level of chaos could not last, that patriots on both sides of the aisle would step forward to control much of what transpired in the past year,” says O’Brien, a Brooklyn-based artist whose work has appeared on over two dozen TIME covers since 1989, covering subjects ranging from the Catholic church to Osama Bin Laden. Outside of his nearly 30-year relationship with TIME, O’Brien’s work has appeared in publications all over the world, including several U.S. postage stamps and book covers such as the popular Hunger Games trilogy. 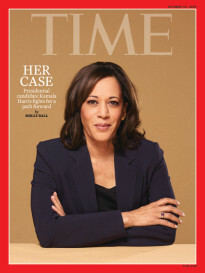 Two of his TIME magazine covers–one with Bill Clinton and Bob Dole and the other with the Grand Old Populists, both published in 1996—reside in the National Portrait Gallery at the Smithsonian in Washington, D.C.
Aside from TIME’s iconic “X” treatment, O’Brien’s cover this week is the sixth time in our 95-year history we designed covers that directly visually reference previous covers we have done. The first instance was in 1998 when TIME republished Roy Lichenstein’s painting of a gun 30 years after it was commissioned for a cover. TIME’s original cover story, “The Gun in America,” with a memorable image by the Pop artist days after the murder of Robert Kennedy, and a couple months after Martin Luther King, Jr.’s. In 1998 on the 40th anniversary of that cover, TIME returned to the issue, prompted in part by a string of school shootings that began that year in Pearl, Miss. Illustration by Roy Lichtenstein, "
In 2001, we called back a concept of “The Incredibly Shrinking President” from 1993—both featuring a diminutive Bill Clinton. When a President leaves office we expect him to disappear for a while, cede the stage to his successor. In 2001, amid a new crop of scandals, the throw back cover was a take on how Clinton’s ex-presidency seemed to be a shriveled version of his presidency, including scandals involving $190,000 worth of going-away gifts, 177 last-minute clemencies (including notably the one he handed to fugitive billionaire Marc Rich. 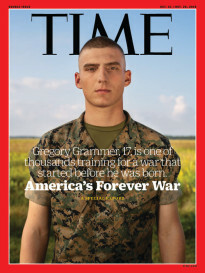 Photographs: Steve Liss for TIME; Brigitte Stelzer-Gamma, "
Illustrations by Sean Freeman for TIME, "
Graphic illustrator Edel Rodriguez created two iconic covers that played off each other, channeling President Trump in his a now instantly recognizable graphic style—”Meltdown” and “Total Meltdown” (the latter winning an ASME National Magazine Award for Best Cover of 2017). Illustrations by Edel Rodriguez for TIME, "